Coming back from a late walk on our country road we heard the rasp of a motorcycle bearing down on us fast, I whirled, camera blazing, and gunned him down. Well, it wasn’t as wild west as all that, more like; I turned, guessed at the aperture and speed at that hour, something the Leica is great for and allows intuition and memory to serve in the moment, and made 3 frames of him coming past us, and the lovely hour, and the sweet space of the road curving away into the hills. It was one of those magical moments when the quiet of the past is settling over the land, and then the intruder – mechanization – comes bursting into the silence, but is gone in a moment leaving behind a slowly returning quiet. I felt that this photograph meant all that to me, even though it looks like a road at dusk, with a headlamp on a motorcycle blazing into our eyes. 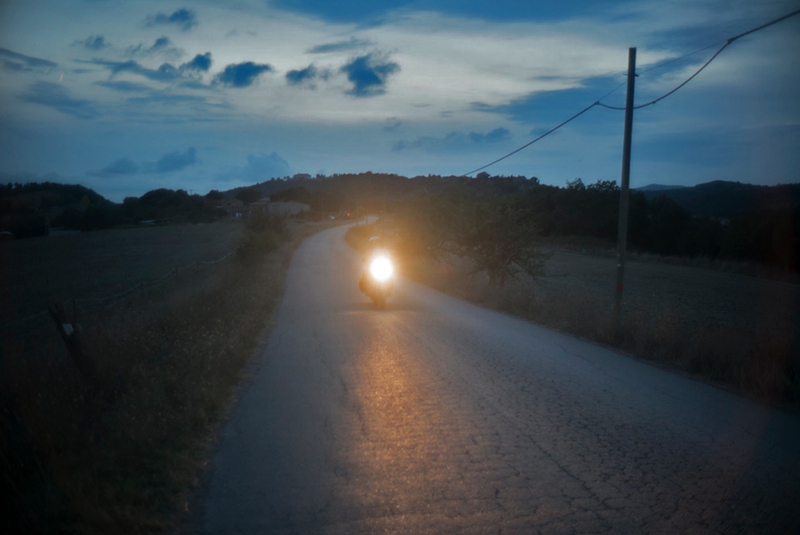 This entry was posted in Evening light, Light, On the Road, Road and tagged Dusk, Light, Road, Tuscany on September 9, 2015 by joelmeyerowitz2014. A photograph is just a photograph. But our feelings cannot be framed, they’re that strong.